Pow! A little fear went a long way on Friday, exacerbated by Thursday’s surprisingly big advance. When all was said and done, the S&P 500 lost 1.9% on the last trading day of last week. Yet, it’s still above all the key moving average lines. Assume nothing. Nokia (NYSE:NOK) did the most damage, losing more than 6% following reports that it was investigating the terms and conditions of a business acquisition made in 2016. Though not likely, any discovery of issues could lead to penalties. DexCom (NASDAQ:DXCM) logged a much bigger loss though, off more than 9% after analysts with Spruce Point suggests DXCM shares could be cut in half as competition within the glucose monitoring system market heats up. Verizon Communications (NYSE:VZ) tried to resist the tide, advancing 2.5% as investors get fired up over its brewing rollout of 5G connectivity. There weren’t enough names like Verizon to keep the broad market even close to a breakeven on Friday, however. As the new trading week kicks off, it’s the stock charts of Twitter (NYSE:TWTR), UnitedHealth Group (NYSE:UNH) and Philip Morris International (NYSE:PM) that are worth some technical scrutiny. Here’s why, and what to look for. It has been a good run. Philip Morris International shares are up more than 28% from their December low. But the weight of the big gain is starting to bear down on the stock, and it’s doing so at the point that’s most opportune for the bears. A pullback wouldn’t necessarily have to be a permanent condition though, and it’s pretty clear where the bulls would regroup if PM shares suffer the setback being flagged here. • The make-or-break ceiling is around $92.80, where the stock peaked last week but also peaked in October. 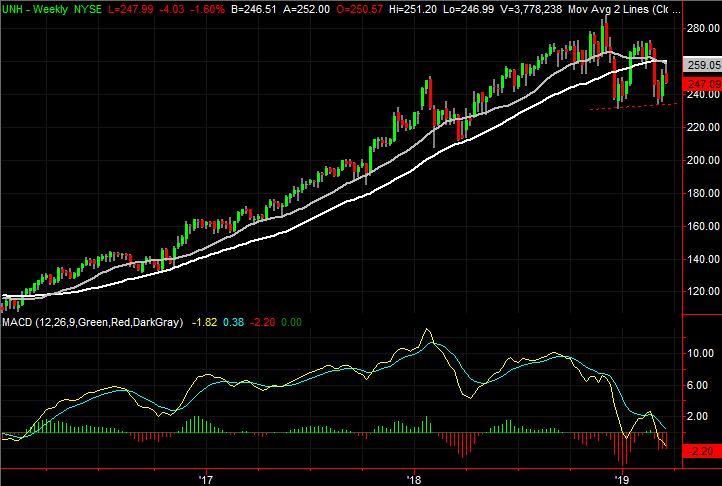 • Zooming out to the weekly chart, we can see shares are stochastically overbought and ripe for profit-taking. • While a setback may be in the works, the convergence of the purple 50-day, the gray 100-day and the white 200-day moving average line could readily combine to act as a floor. For the past several months, the bears have been trying to upend Twitter but have been unable to do it. That has given the stock time to regroup, and even move into a position to stage a full recovery. That’s not happened yet, but one or two more good days could do the trick. And, that effort is taking shape with a very encouraging backdrop. • The foundation for the renewed bullish effort is the support supplied at $26.30, where shares made a double bottom in the latter part of last year. • But the big buy trigger here is a move above the white 200-day moving average line and above the falling resistance lines that has tagged all the major peals since December. It’s plotted in yellow on both stock charts. • Fanning the bullish flames — at least partially – is the big bearish gap left behind in July. The upper edge of the gap range is just above the $42 mark. Finally, in late February UnitedHealth Group gave a second — and pretty decisive — selloff that largely confirmed a major downturn was in the works. That panned out as expected, with UNH stock making a few more days of selling. The bulls did push back, but that effort crumbled and turned back into a downtrend right where one would expect. The renewal of the downtrend at the ideal ceiling sets up a third bearish leg that could end up turning into a bigger selloff than the last couple of setbacks have been. • The rally effort was stopped and reversed just as the white 200-day moving average line was bumped. 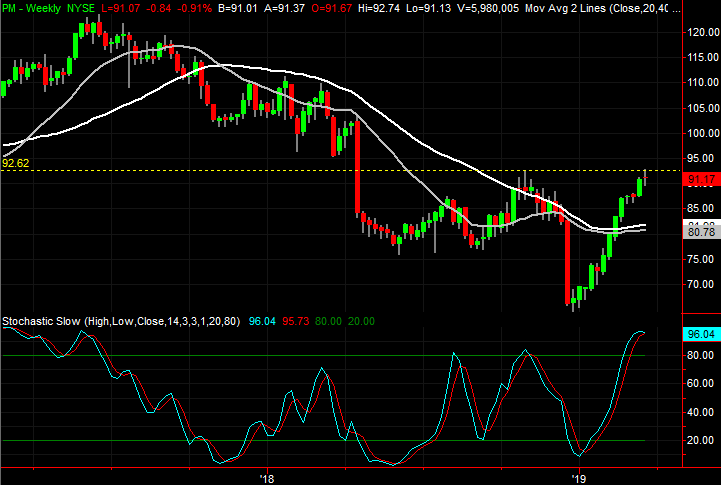 That reversal is highlighted on the daily chart. 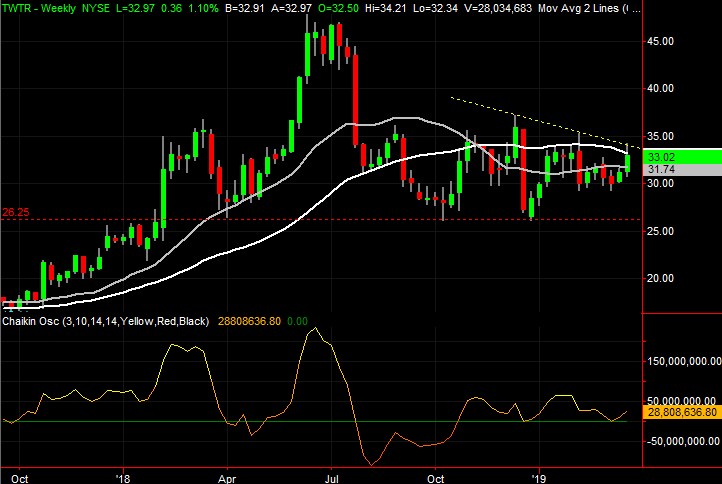 • The big floor from here is around $235, in line with the past two major bottoms UNH has made. That support is plotted with a red dashed line. • The weekly chart puts things in perspective. The three-year advance was amazing, but arguably overcooked. A little more weakness could easily turn into a lot of profit-taking. The post 3 Big Stock Charts for Monday: Twitter, UnitedHealth Group and Philip Morris appeared first on InvestorPlace.